It always happens on my watch. I refer to it as giving my children ‘freedom and independence to roam’, Dr Mummykins (my wife) calls it ‘reckless and lazy childcare’. Either way, they fall. They cry. And then the ever worrying questions; have they hurt themselves? Is anything broken? 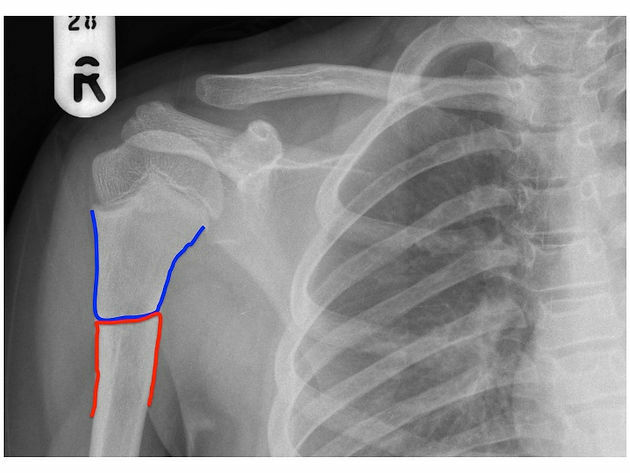 …it is wise to get to hospital so that they can have an X-ray to check for any fractures (FYI a fracture = break = crack). As an orthopaedic surgeon my trauma theatre lists usually start off with a child requiring an operation of some sort. Standard narrative ‘this five year old fell off a trampoline/skateboard/third shelf of the Billy bookcase that they were climbing (whilst the responsible adult was watching football/cooking lunch)’. The very meaning of the word ‘orthopaedics’ comes from the Greek words ‘straightening children’, although only a very very small minority of children ever need to have an operation for a broken bone. How do we decide what needs to have orthopaedic input? Children’s bones differ significantly to adult bones. They are bendier and much more elasticand so when children fall they tend to sustain ‘buckle’/ ‘greenstick fractures’. The analogy is that of trying to break a fresh twig or branch in two, it tends to ‘buckle’ on one side rather than snap. FIG 1. 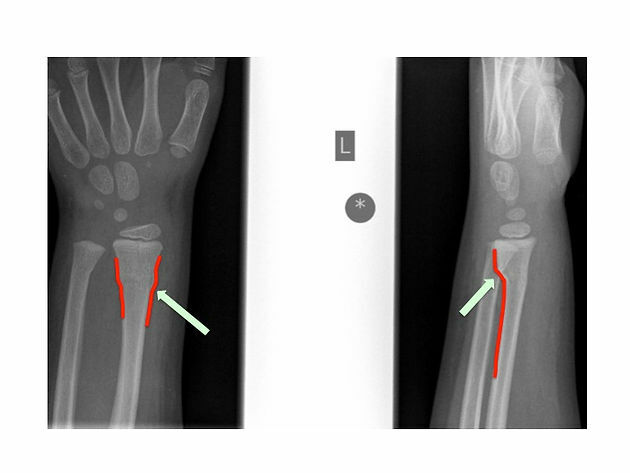 The x-rays above show a buckle fracture at the wrist of a 5 year old who fell off a scooter. The bone is bent/kinked instead of being perfectly straight as it should be. Obviously grossly deformed limbs following a fall need to be straightened but this occurs in a minority of cases. Children are amazing little creatures. As loud as they are, they are equally good at self-healing. Within a couple of weeks the bones will have healed. In fact, the younger they are, the faster their bones heal. Furthermore, their growing bones have the ability to undergo a process called ‘remodelling’. This means that their bones will not only heal quickly but with time can actually re straighten and resume their normal shape, size and orientation! It is truly remarkable. FIG 2. This is the shoulder of an 11 year old that fell off her bike. She has broken her upper arm bone very badly. The break is not lined up at all! Certainly our fracture clinics are filled with injury prone toddlers and their bony injuries. The question we have to ask ourselves as orthopaedic surgeons is do we really need to intervene or can we allow little Antonia’s amazing biology to do the job for us. Our hardest challenge in reality is managing you, the parents. Antonia is very happy in her bright pink plaster that her brother Thomas and friends from school can all scribble on. However Antonia’s parents are understandably concerned that she will end up permanently disabled or disfigured. Everything CAN have an operation but that does not mean it SHOULD have one. FIG 3. We decided against operating on the girl who fell off her bike. 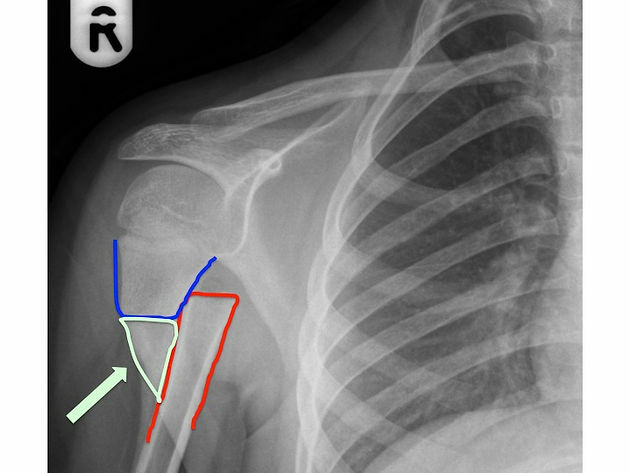 The xray above shows new bone formation (highlighted in green) by 3 weeks. She was moving her arm normally by this point! FIG 4. This xray is 8 months after the fall. The bone has completely healed and remodelled to it’s normal shape and length without any help whatsoever from us. Amazing! 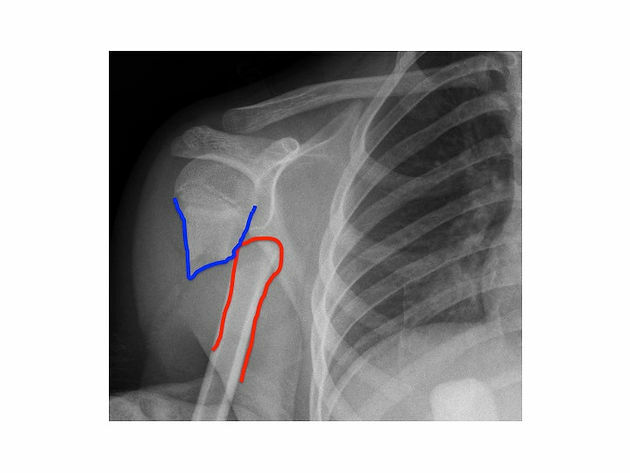 There are some absolute indications for surgery: severe deformity of bones, injuries with potential damage to nerves and/or blood vessels, breaks when the bone has poked through the skin (open fractures), breaks involving joint surfaces. We will of course point these out to you and recommend surgery in such cases.